TV studio equipment is an ever-evolving technical phenomena. Constantly improving technology and design gives the video producer more choices about what equipment to use. The good thing is that technological improvements usually means it takes less equipment, less money and less effort to produce the same quality. This is incredibly true when it comes to studio production method. Today, for a fraction of the overall cost, computers allow you to set up an incredibly functional production studio. The amount of equipment is so much less than what it used to require that you can even pack it all inside a van if you want to make video on-the-go. The new computer-centric production studios are a fantastic new addition to the video producer’s tool bag. The NewTek VT5 is probably the most advanced and most sophisticated, but there are many other options. I’ve seen some software programs for $300 or so that will synch up multiple cameras, mics and give you digital effects capacity. However, standard TV studio equipment still has many applications. Even if you use the new computer based technologies, it helps to know all the individual components and what they do. The rest of this post contains that information. If you’re ready to take the plunge and set up a simple TV production studio, here’s some basic information and advice to get you started. You have tons of possibilities. A video production studio can be a permanent fixture in your home, yet the same equipment is 100% portable in case you want to cover the county fair. Many people operate businesses taping weddings and graduations with these kinds of studios. Such a set-up would be perfect for an Internet business wanting to make product demonstration videos, marketing videos or informational products. The least expensive way to do it is to opt for using what is essentially an adapted security home camera system. I’ve seen $400 security camera systems meant for home use that would work for some video production applications if you did a bit of reconfiguring. On the other hand, a well-equipped, fully functional studio could add up to over $100,000. Depends on what you want and how much money you have. For $30,000 – $50,000 you can get a professional set-up that would allow you compete with just about anyone. As computer have gotten more powerful, the amount of equipment you need continues to drop. Today, one mega computer can do what it used to take five to ten components to do. With the correct software, a computer can be the heart of an incredibly powerful portable (or stationary) video production system. For more information on that subject specifically, here is a post about a friend of mine who operates a production van with New Tek equipment. They do high school football games and other large events for the county government. Today, the Blessed Angels in video engineering have actually devised virtually wireless studios, a production gal’s dream come true. You can have both wireless microphone systems and wireless video systems. If you set the transmitters to different frequencies, you should avoid interference. Three cameras free to set-up anywhere in the stadium, even being mobile during the game. Wireless studios are a technological wonder and a sweet blessing if you ask little ole me. If you have wireless system, think about making one camera a roving hand held. It can greatly increase your visual possibilities no matter what kind of event you are covering. Today’s computer systems used for studio production knock the socks off the separate components traditionally needed for video production studios. Anytime you can condense or eliminate equipment, you have made studio video production cheaper and easier. With today’s all-in-one systems, different types of graphics generators and system control functions can be run by one computer instead of twenty separate components connected with a mass of cable spaghetti. As technology improves, so does the ease of creating a TV studio. WHAT KIND OF VIDEO EQUIPMENT IS NEEDED? 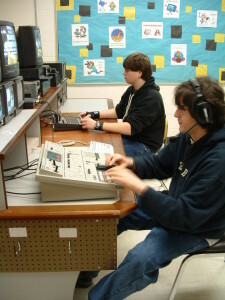 My high school students working in the video production control room. Most studios have at least three cameras. With vigorous and quick camera operators, three cameras can be made to look like a thousand. The cameras don’t have to be the same kind, but they usually are. That way, you will have a more consistent image. To connect it all up together, make sure you have all necessary and compatible cables that match the video output connectors. Before you buy anything, draw it all out to make sure everything is easily compatible. Study the back side of all your components for information about what kind of cables and connectors you need. Generally, all the cameras in a studio are on large, studio mounts that can glide quickly and easily across the floor. These type of camera mounts aren’t meant to be picked up and hauled to a room down the street. But if a $25 tripod from Wal-Mart is what you have, that’ll work too. A video studio does not have to be fancy. Big-budget studios have cranes and all kinds of awesome gizmos to hang cameras from the ceiling or swoop in a 360 degree arc to create a visual thrill. Next time you watch the open for Oprah you’ll see what I mean. A low budget video studio is more likely to have moderately priced tripods ($200) or even the cheap tripods ones for $25 from Wal-Mart. Video Switcher: This is the jewel that eliminates hours and hours of editing! It allows you to edit your show live, on the fly instead of piecing it together later. A video switcher is set up to have every video input in the studio running into it. All of your cameras, all of your graphics generators, all of your tape decks, satalites, microwaves, or computers are fed into your video switcher. A large switcher might have forty, sixty, eighty video inputs. Small ones have four inputs, which was plenty for the small studio I ran when I taught high school TV production. Most small video switchers also accept four audio inputs. They’re priced from about $1,000 to $6,000 and on up. The director operates the switcher, punching buttons and turning knobs on its large flat surface to control which video signal is seen and when. The viewer sees whatever video input the director wants them to. This is shown on the monitor connected to the output of your switcher. The video switcher will have some digital effects and can cut or dissolve between two signals. You can get add-on components that increase the number of digital wipes and effects. This would be called a digital effects generator, or DVE. The video switcher also mixes together all the elements you need for a chroma-key, or the green screen effect. This will be a blending of at least two video sources, the subject shot in front of the green and the image that replaces the green. This is the video switcher we used in my high school class.It was capable of doing green screen and had 4 inputs. HOW MANY PEOPLE DO YOU NEED TO OPERATE A VIDEO STUDIO? A director who usually operates the video switcher and takes charge of the production and talks to other crew members via the off-camera audio headset system. Various people on that staff list can easily be eliminated or replaced by robots if you have that kind of budget. Many network news studios use robots instead of human camera operators. If your budget is more modest than CBS, consider a locked down tripod instead of a camera operators. Camera operators aren’t really necessary with the style of many simple talk shows. The less people on camera move, the easier it is to get by without camera operators. If you’re a small operation, get by without camera people or those expensive robots so hated by labor unions. Lock down all your cameras on logical shots and repeat them. In between shots, sneak up to one of the cameras, change it quietly, sneak back to the switcher and punch up your new shot! However, if you have a larger budget, think about having a larger crew. Camera operators can make your life easier. Some switchers can also performs color adjustments and digital effects. In essence, your switcher is the heart of your studio. The more sophisticated your switcher, the more signals you can put up on the screen at once. For example, during a wedding you have a close-up of the bride, a close-up of the groom, and an extreme close up of the ring all on the screen at once. At the bottom of the screen you could add “Jennifer & Bill, 2007.” That would be four different video inputs, all going though the switcher. Many studios have an audio switcher in addition to a video switcher, but you can buy units that combine the two functions. Studio video production involves mixing multiple microphones and other audio sources like CD players, into one audio switcher that is controlled by an audio specialist. This person mixes the audio sources and turns them on and off at the appropriate times. The output of the audio switcher should be viewer ready. Here is a shot of the video production studio I ran as a high school video teacher. It was simple, but effective. Not fancy at all but we did some great videos there! In fact, it was so simple, my high school TV production studio wouldn’t pass fire codes so we couldn’t use grid lights! so we used portables as you can see in the picture above. Portables are much more practical for a small operation, especially if you also do remote productions. Most of your portable lights will be set up on collapsible stands, but you can easily hang small light fixtures from just about any ceiling if you find the right ceiling mount. I used to carry one that wasn’t too much bigger than a finger when it was collapsed. My High School Video Production Studio with portable lights to satisfy fire codes. A low budget studio can still hang lights or cameras from just about any ceiling if you buy small mount adapters that can be easily slipped under tile ceiling framework. These ceiling mounts let you hang lights, cameras, or microphones in out-of-the-way spots. Great for that high-angle wide-shot or a hair-enhancing halo back light. C-clamps usually work for this kind of thing. It’s best to use really small lights is you do this. Lowell makes lots of really nice tiny TV lights. Professional studios have concrete ceilings with a heavy metal grid attached. High wattage lights are hooked to the grid and plugged into the ceiling. This can be cost prohibitive for the small guy, not to mention a fire hazard unless you’re wired especially for this type of heavy-duty application. So you might want to consider using portables. You’ll have more cables snaking the floor and portables take up valuable space, but you’ll save a bundle. Studios have tons of monitors. Generally, every video source has to have its own monitor. Preview monitors. Output monitors. Monitors that show the mixing process of various sources. The plethora of monitors can cause a newbie in a studio to get confused, but one you get it all straight in your head it makes sense. Each camera will be hooked up to a monitor that the director can see in the control room. The studio camera operator doesn’t look at the monitor; she looks at the camera viewfinder. In order to have enough video signals to run both your monitors and your record decks, it is necessary to split your video signals. (One signal runs to the monitor and the other one runs to the record deck.) If you do this, run the signal through a pre-amps to boost it and negate the effects of splitting. If you want to read a second popular post about setting up a video studio click here. Make sure and read all of the comments, there are close to 50 on that post. No matter what kind of video equipment you want to buy, I always like to recommend shopping and researching video equipment at B&H Photo. They carry everything and have great prices. As technology improves, video production equipment used for mobile studios gets more and more integrated, more versatile and more functional. If you’re a lover of electronic gadgets, video production is a great obsession! i do await your advice and further more as regards. I would like to inquire if you offer free on line or i learning video production courses and what are the requirements. if not yes, i too request you offer me alternative contacts. Thanks so much for writing, it is wonderful to hear from you. I think your mission to set up a video studio to educate people on the problems you mention is indeed a great goal in life. Unfortunately, I do not have any used equipment to give you. I wish I did! Don’t give up though. I think you should keep asking people, you can probably find someone with excess equipment willing to donate. Maybe someone will see your post here. Try larger organizations. I am just an individual, but a large organization would be more likely to be able to help. Yes, I offer a free online course in video making. All you have to do is sign up and it is free. There is a sign-up box on every page of my site, it is located on the right hand side near the top. In addition to that, if you browse through the blog, I have articles and tutorials on all phases of video production. Goodmorning, just to find out is internet videogal an individual innetiative or its an institution, i get so inspired by what you are doing to run such beautifull pages and hope to have the same in our local network in future. i request for yoour advice , a local institution is opening up here in uganda that trains people with interest to run the video industry but most people alike mysef have lost interest in this institutes that open up because most of them are more buisness focussed and most times only cheat people and cone them , so after a short while they disappear and you hear nothinng about them yet after taking your tution, as regards none loves to join them yet many people could be interested in the industry. with this challenges in mind, are you able to offer such training on line? i have done a diploma in journalsim but would love to bias to video production, but dont know how to get there. i too would love your advice qas regards, i hope to run a public simple video production studio but cannot afford the expensive electronics, how can i start small yet have some thing running on.i beleive small can do majic but we just need to know how to start it. am also torn between persuing, film directing, film production , video editing , otherwise i need your advice on which complete package i could have. i too would like to find out if you can take me through a specialized course other than the general . i hope am not asking for too much too soon but i have utmost passion and love for the industry and thanks to God , i beleive i have found you to sail me through. i wish you a good day and am waiting on your reply. Fantastic to hear from you. Your very sweet message totally made my day and I am thrilled to hear how much my blog has helped you. I would love to help you out as best I can. I am just one individual, not a big organization at all. So my resources are limited but I will help you the best I can. I think your mission is fantastic and I would dearly love to help you within whatever capacity I can as an individual. I can give you some specialized training if that will help. Perhaps we could document your progress here on the blog. We will talk more later. Nice to read from you always.iam very encouraged when you have an inspiration of helping me through.Now lets do it this direction, could you be having some donor connections that we could contact for that kind of project? is it possible that we can share a proposal format in that field of interest that can easily hook a donor interest?. just to findout, how are you able to reply to all this mails that come to your blog more especially with an an assumption that you have very many subscribers and admirers, how are you able to do this? I am able to do this because I spend virtually every waking moment working on this blog! I really do, and that is not a complaint at all. I love this blog and answering people’s questions directly is one thing I enjoy! It is amazing to me to be able to help folks out from all over the world. I truly feel privileged and honored so spending my time answering people is a joy, not a chore. I could help you write a letter for donations but I personally do not know anyone who could help you. I can give you advice on what to say and which type of organizations to contact, but beyond that I do not know if I can do much. Would you like for me to help you write such a letter? i will keep on wait. thanks for being that generous to help the world out, have you tried serious marketing on your pages for commercial slides? Great article! I’m in the process of putting together a proposal for a television show that will be airing on a national level. I’m used to the one camera set as a director but have previously done studio configuration production and directing… in college! The article helped out a lot. Thanks for sharing your thoughts and knowledge with everyone else in this industry. Does anyone have any comments on the Sony NIPROS studios configuration mount for the Sony EX-3 camera and types of switchers that won’t kill my budget too much? That is NOT an affiliate link. But I still recommend that product. I have a long time video pal who uses it and loves it. In fact I will be posting a video of him and his mobile video van in the not-too-distant future. Good luck to you! Keep in touch. Thanks for your reply and for your suggestion of the switcher. The only issue that I’m having with that is that I’m using all Mac products to capture and do most of my post. Since my budget is not too high, I can’t afford to purchase another computer system since I already have one. I do have a suggestion. Try boinxTv. I have not personally used it but it sure sounds wonderful if it indeed works as well as the advertising indicates. If you get it, let me know how you like it! Thanks for these extremely useful bits of information! I am in the process of creating a proposal for a community TV show, one to two-hours long to air through Comcast. I am pricing, as we speak, all studio components. The show will be tape-live in format. While most information is available herein, is there a specific ‘shopping list’ available anywhere, even for a cost? I am specifically hoping to find a comprehensive list with equipment that integrate well with one another, from cameras to video-switchers to computers etc. Also, is NIPROS system mentioned above necessary for the format I am talking about? Again, thanks immensely for this great source of information! I do not have a specific “shopping list.” Sorry! NIPROS is not necessary, that is a Sony specific thing. Stick with one model of camera for the most uniform look. The NewTek VT5 is what I would buy if I were outfitting a studio. This gives you all the power of studio production within a computer. I’ll have more info on that system posted in a few weeks because a friend of mine uses it and I shot some video with him. I am glad to hear that the info in this article will help you! i was following i want to setup a small and low cost studio. please can i get the costing. Thanks for your comment. I personally do not sell equipment so I can not give you a special offer. Try B&H Photo.